Signal Seeker Ubiquitination Enrichment Kit (immuno-precipitation format) - Cytoskeleton, Inc. Figure 1: Swiss 3T3 cells were pre-treated with MG-132, then either untreated or treated with CNF1 (CN04) for 3 hours prior to lysis with BlastR buffer. The BK161 kit was utilized to perform the IP on 300 μg of lysate per condition. Lane 1: 3 μg input untreated lysate, Lane 2: Ubiquitin Affinity beads (UBA01) plus untreated lysate, Lane 3: UBA01 plus CN04 treated lysate, Lane 4: ubiquitin control beads (CUB02) plus untreated lysate, Lane 5: CUB02 plus CN04 treated lysate. 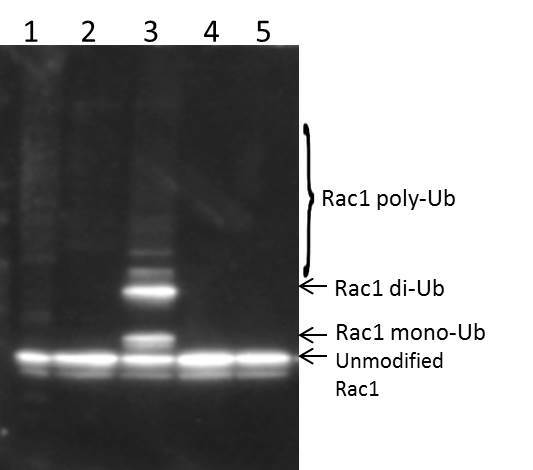 Samples were analyzed for Rac1 ubiquitination using an anti-Rac1 antibody. The activity of the Rho family of proteins, including Rac1, is known to be regulated, in part, through ubiquitination (also termed ubiquitylation) events that can lead to signaling pathway regulation via degradation and/or localization of the modified protein (Visvikis, O. et al. 2010. Biol. Cell 102: 377-389. Nethe, M., & Hordijik, P.2010. J. Cell Sci. 123: 4011-4018). In many cases, the GTP-bound active form of Rac1 is the preferred substrate for ubiquitination. For example, it has been shown that cells treated with the bacterial toxin CNF1 leads to constitutive activation of Rac1 and subsequent mono- and poly-ubiquitination (Pop, M. et al. 2004. J. Biol.Chem. 279: 35840-35848). Using the Signal-Seeker™ Ubiquitination Detection Kit (Cat # BK161) we examined the ubiquitination of endogenous Rac1 in 3T3 cells treated with CNF1 toxin (Cat # CN04) and found that both mono- and polyubiquitination of Rac1 could be detected from 300 μg of 3T3 cell lysate. The kit offers a user friendly tool to examine mono- and poly-ubiquitination for any target protein. • Investigation of the relationship between Rac1 activation and ubiquitination under a variety of different growth factors or drug treatments. • Examine the interaction of ubiquitinated Rac1 with effectors. 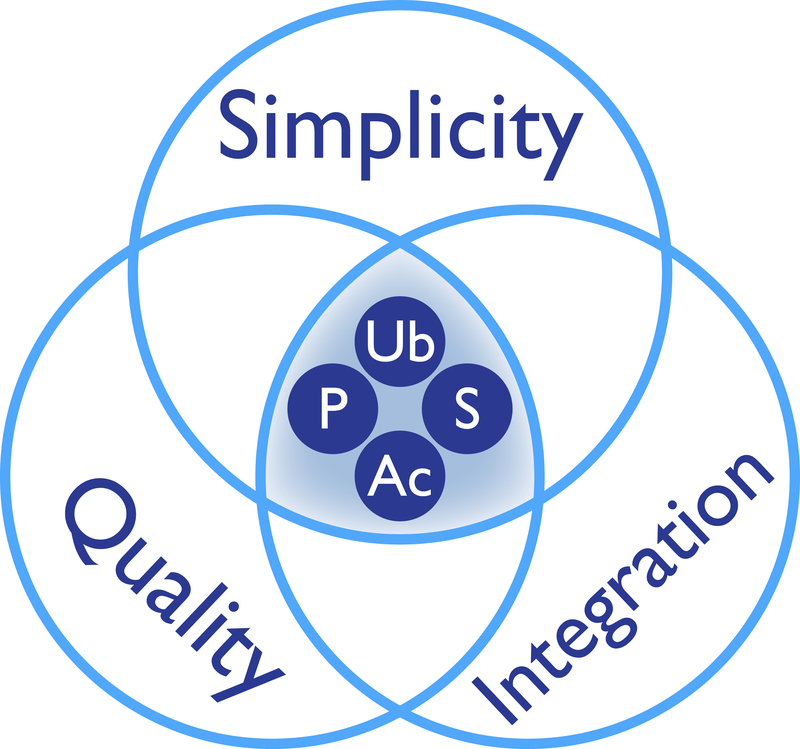 • Examine crosstalk between ubiquitinated Rac1 and other regulatory PTMs of Rac1.